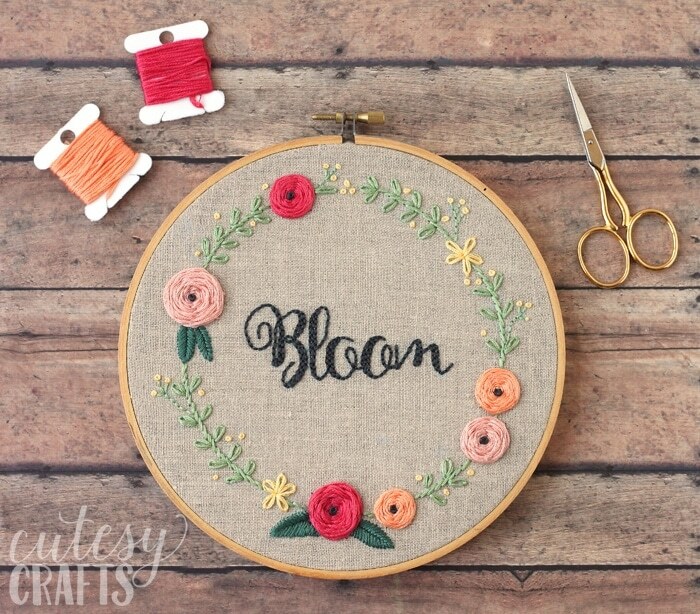 With the great weather we have been having, I was inspired to stitch up something pretty for spring. I don’t know what it is about hand embroidery, but I love it so much! 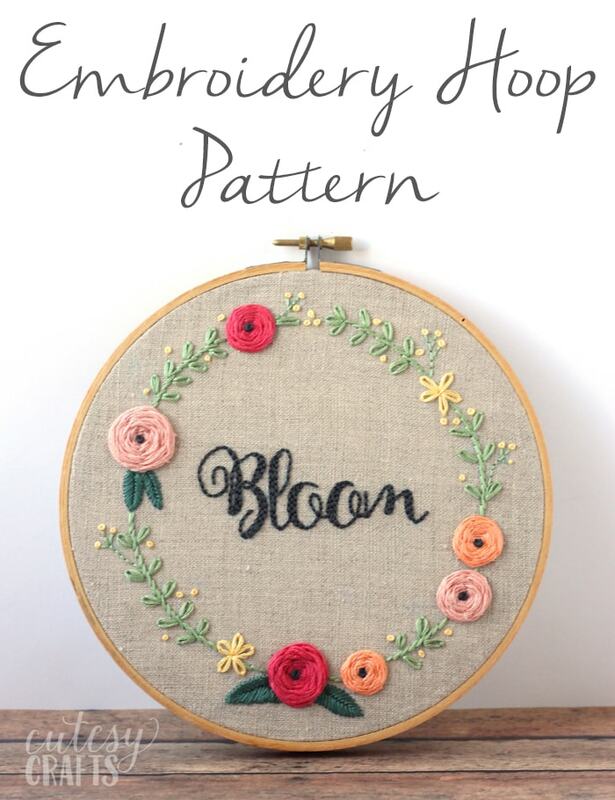 I’ve got a free hand embroidery pattern for you today, and throughout the next few weeks, I’ll be recording a video stitch-along to show you each of the stitches. Subscribe to my YouTube channel to make sure you don’t miss it! Scroll to the bottom of this post or click here to see all of the videos that have been published. If you need help with any of the stitches, I also have video guides on my embroidery stitches guide page. It all started with these pretty flowers that I just had to try. They stitched up so beautifully, and they are a lot easier than they look. They are made using a woven wheel stitch, with a french knot in the middle. I’m not really sure what kind of flowers that makes them, but I love the way they turned out. Stitching the words like this was a first for me as well. Again, super easy though. All I did was outline each letter in a back stitch and then filled them in using a back stitch as well. The large leaves were done in a fishbone stitch, and the small leaves are lazy daisy stitch. 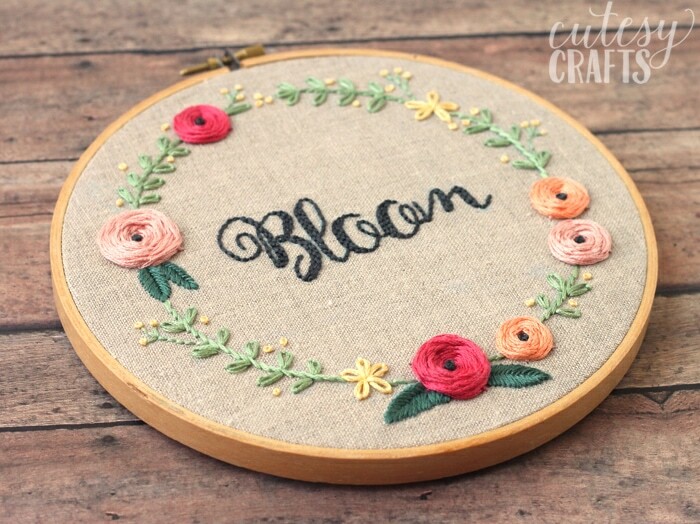 I used a seven inch hoop and stitched it on natural linen fabric. I was a dummy and wound my floss on new spools before labeling them, so I only know some of the colors that I used: DMC 335, 3779, 501, 368, and 3799. That should just leave you needing a light orange and yellow I think. The rest of the stitches are listed on the pattern. To get access to the free pattern, enter your information in the form below or click here to subscribe to my newsletter. It’s free, and I’ll keep your email address safe. You can also unsubscribe at any time. 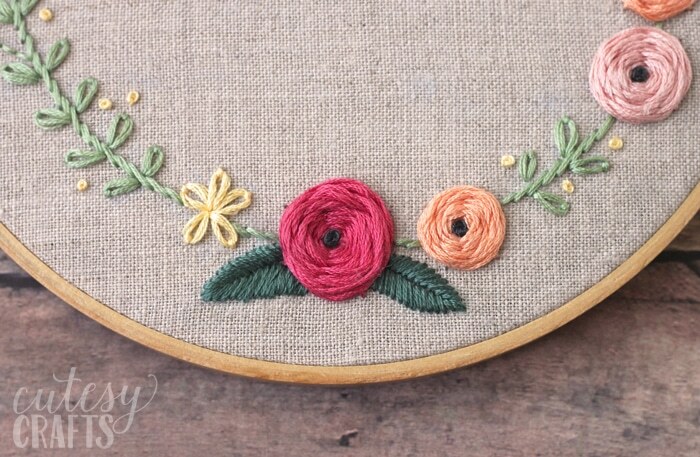 I’m so happy with how this hoop turned out, and I really enjoyed relaxing with some hand embroidery. I’m thinking my craft room might need a whole wall of embroidery hoops, so I’ll have an excuse to make more. What do you think? Make sure to check out my other hand embroidery designs. I’ve got lots of free embroidery patterns! Here is the first video for the stitch-along. Click here to watch the rest on YouTube. 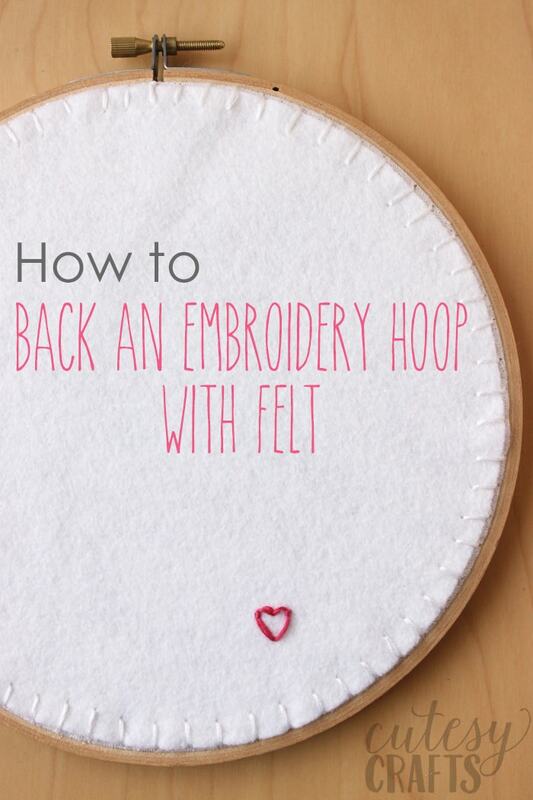 Learn the best way to back your embroidery hoop with felt! 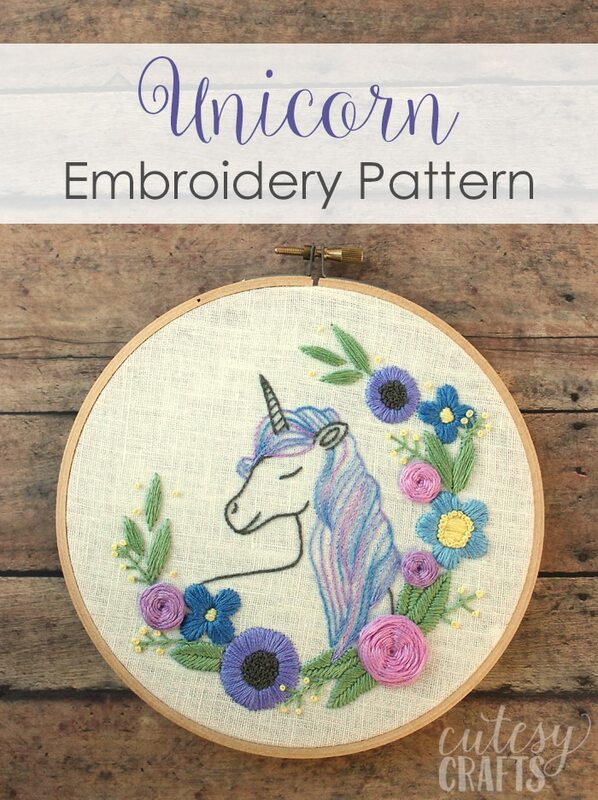 Get this free Unicorn Embroidery Pattern! This is so perfect! I love the use of new (to me) stitches. I can’t wait to give it a try! Thank you for sharing. Thank you! So glad you like it. 🙂 I loved trying out these stitches too, and I can’t wait to try more! 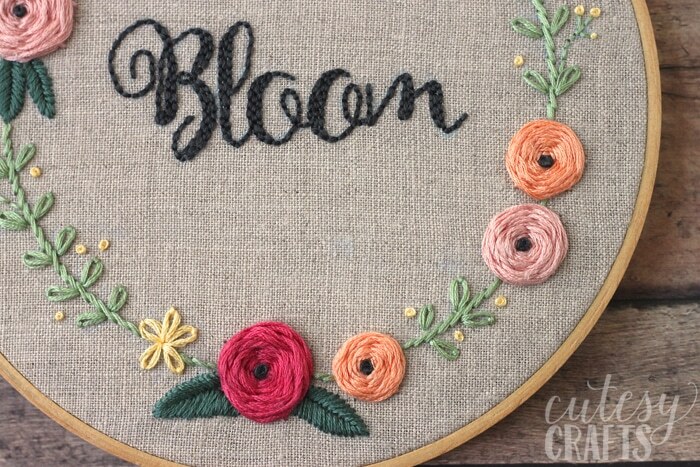 I use DMC embroidery floss that you should be able to get at Joanns or Michaels. I usually sketch out my ideas and then scan it into my computer. I use a free program called Inkscape to trace my designs so I can resize and fine tune them. Beautiful! I would like to make this for my mother in law for her 90th birthday but want to stitch the word ‘CELEBRATE’ instead. What font did you use please. Thanks! Cute! I used “Ballerina Script” which you can get on dafont.com. What kind of fabric are you stitching on? Where’s The drawing to print it ? There is a link in the post that should take you to a download page. Let me know if you have trouble with it, and I can send it to you. HI, i am having trouble to find the link to download the pattern. You need to fill out the form in the post with your email address to sign up for my emails, confirm your subscription using the link in the email I send, and then you will get the link. Let me know if you have any trouble with the process, and I’ll be happy to help! Thank you! This was my first attempt at embroidery. Your videos were very helpful and I loved that I learned so many useful stitches. If you reply, I’ll send you a pic of my final piece. I think it turned out really nice. Yay! So glad you were able to learn from my videos! I would LOVE to see how it turned out. My email is cutesycrafts (at) hotmail (dot) com. I can’t find the pattern link anywhere? Hi Maddie. You need to subscribe to my email list, using the form in the post or going here: https://cutesycrafts.com/subscribe You will then get an email with links to download the pattern. 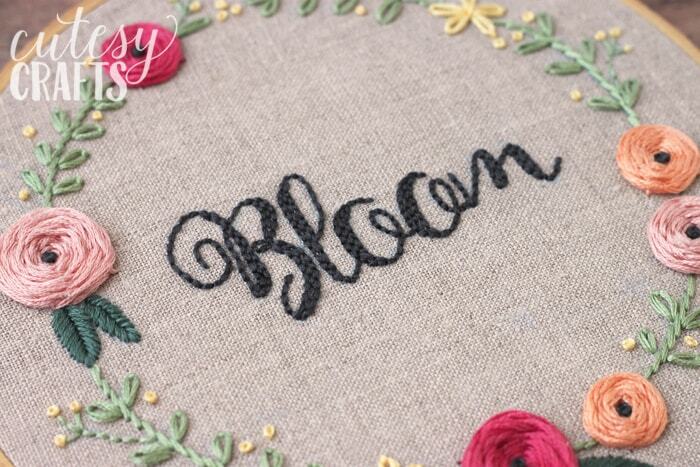 Which type of stitch used for the font? I used a backstitch. Two sid-by-side rows on the thicker parts. Follow the link to my YouTube videos to see the stitching in action. Where did you get your linen fabric? Did you Pre-wash your fabric before starting the project? Thanks! I just use 100% linen from Joann fabric. I don’t wash it since it’s not something that I’m going to wash later. Oh thank you! I’m SO glad that I’m able to teach you to embroider via the internet. 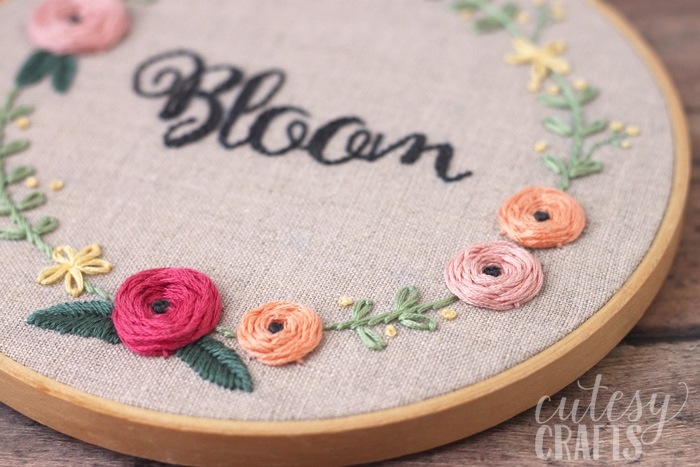 Embroidery is a fairly inexpensive hobby, so you chose a good one. 😀 Have fun!